Duane Statler is disappointed, but he's not giving up. 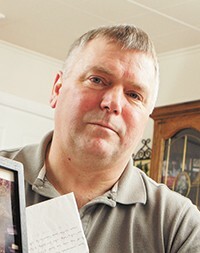 Last month, a Spokane County judge ruled that his son Paul and two other men would not receive compensation for the almost five years they spent in jail as a result of a wrongful conviction made possible by a jailhouse snitch. Now, a bill that could have prevented their convictions died last week. Duane Statler wants to limit the use of informant testimony. Statler has pushed for three years to drum up support for bills requiring criminal informants' testimony to be corroborated by another piece of evidence. The bills also would require juries to consider what witnesses are getting in exchange for their testimony. In the case of Duane's son Paul, Tyler Gassman and Robert Larson, an informant got a possible 30-year sentence reduced to 18 months. "I really thought when it got through the first reading and was assigned to the Rules Committee, that we had a home run," Statler says. "We're just not having too good of luck." The House version of this bill didn't make it past a first reading despite bipartisan support from local lawmakers Reps. Marcus Riccelli (D), Matt Shea (R) and Bob McCaslin Jr. (R). The Senate bill, however, made it to a second reading in the Rules Committee. Senator Mike Padden, R-Spokane Valley, one of the bill's sponsors, says he'll continue to support the reform next year, which would strengthen jury instructions in Washington to reflect those used in federal courts. Lara Zarowsky, policy director of the Innocence Project Northwest at University of Washington, was disappointed to learn that neither bill made it any further, but is encouraged by legislators' willingness to talk about this issue. "This is clearly a problem in need of a solution, in the fact that false testimony presented by incentivized informants is one of the leading causes of wrongful conviction in our country," she said during her testimony before the Senate Law and Justice Committee in January. "We have a situation where there is great incentive to give false testimony, but very little disincentive." Tom McBride, a lawyer with the Washington Association of Prosecuting Attorneys, has a different view. In his testimony during the same January hearing, McBride argued that juries in Washington are already notified of any compensation to witnesses. A bill requiring more instruction would be unnecessary, he says. One idea Zarowsky has is to require pretrial reliability hearings, where a judge would hear the testimony and decide if it can go before a jury. A similar safeguard has been put in place in Illinois. Statler is still hopeful that the legislation will pass next year. He already has a meeting with Sen. Andy Billig, D-Spokane, on the books as soon as this year's session ends.